we choose the life we want to live. Never allow your past to dictate your future." Strong, hopeful and charismatic, Stacey Lannert doesn't just speak about overcoming childhood sexual abuse. She connects with her audience. Viewers feel her pain and, most importantly, her triumph. Stacey was recently released from prison where she served 18 years for fatally shooting the man who raped her from ages 8 through 18. That man was her father. Stacey never lost her ability to love life and learn from it even though she was sentenced to life without parole. The governor granted her clemency in 2009, and within 6 days, she walked out of the prison gates. Stacey had been granted her physical freedom; it was the ultimate act of forgiveness. Though locked up, Stacey was already emotionally free. 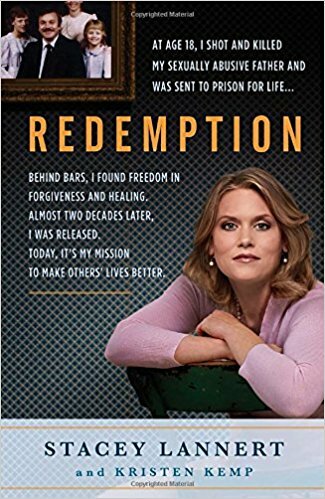 Through the power of love and forgiveness, she created a meaningful life for herself from behind bars. She helped troubled teens find strength to tell their stories of abuse through a program called Outreach. She even helped two of them prosecute their abusers. Stacey also trained therapy dogs for handicapped people through the non-profit organization called C.H.A.M.P.S. While she was making the world a better place, she was also focused on forgiving. Filled with compassion, hope, humility, and even wit, Stacey's thought-provoking messages serve many purposes. Her topics of discussion include: How to spot sexual and emotional abuse and what to do about it; The importance of speaking up, telling the truth and never being ashamed of who you are; The power of hope, forgiveness and helping others; And the legal system that can still be antiquated in how it deals with sexual abuse and women. What can we do to improve our lives and help others? In May 2009, Stacey brought her message of strength, hopefulness and inspiration to 40 million people when she spoke for 30 minutes on The Oprah Winfrey Show. Stacey has also appeared on Nancy Grace, 20/20, Larry King Live, Montel Williams and many other programs. She has created a popular, active non-profit organization and website called HealingSisters.org with a message to help other victims however she can. Stacey can share her story. She doesn't believe that any of us are victims no matter what we've been through. As we work on ourselves and work to heal the world, we all become victors. Stacey graduated in the top third of her class at law school in May 2017 and will sit for the bar exam in September. She’s also been appointed by the Governor of Missouri to the state’s Justice Reinvestment Task Force, proving that a person always has the ability to overcome their past if they focus on the future. Looking ahead, Stacey plans to work with abused children and battered women who find themselves in need of legal assistance. Ms. Lannert’s hold on the audience was profound. She was engaging, honest and combined vulnerability with strength. It was a powerful evening that I know our students will remember. Ask about adding a complimentary book signing to your event! Want to talk with us about Stacey Lannert?